Born in 1960, the Japanese composer Mari Takano studied in Japan and then Germany, where György Ligeti became a mentor to her, providing liberating impulses. Ligeti is also a near-constant presence throughout this programme of works composed between 2003 and 2009. 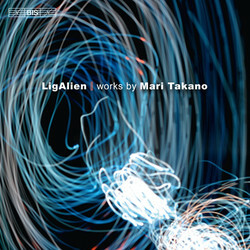 Interspersing the four 'LigaAliens' are two solo pieces, Jungibility for piano and Full Moon for violin and electronics, which also embrace a wealth of ideas both musical and otherwise – when discussing the works, Takano herself refers to Duke Ellington, Omar Sosa and Stockhausen (Jungibility) and Björk, Pina Bausch and Miles David (Full Moon). Dedicated to the memory of Ligeti, the closing Flute Concerto is the largest work on the disc, both in terms of duration and the forces involved. The present recording also appears on a previous BIS disc (BIS-CD-1649), released in 2008, and the work was described by reviewers as 'a score which can move to a pop music beat without sinking into triviality or bombast' (in Gramophone) and 'a clever, rewarding work that will reward repeated hearings' (on the website Audiophile Audition).